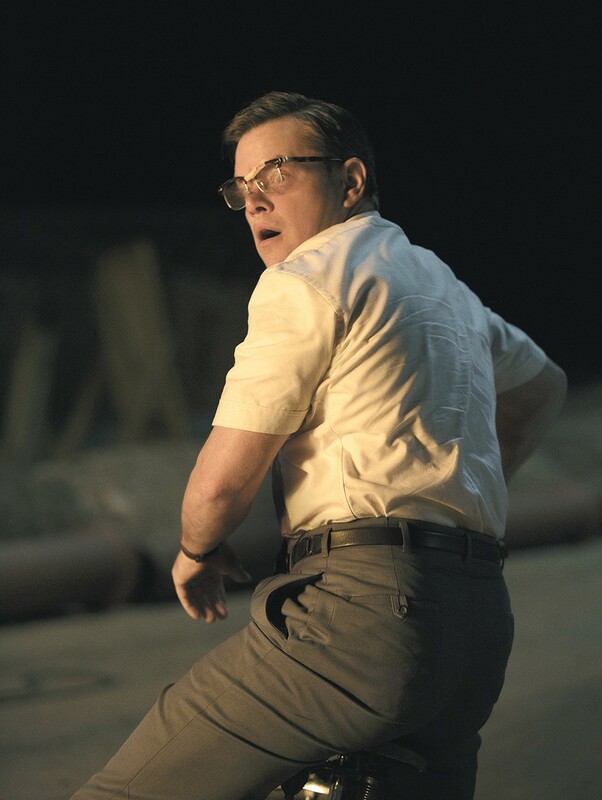 Matt Damon's a bad dad in Suburbicon. George Clooney, like most powerful, creative types, needs to be told "no" more often. He and regular writing/producing partner Grant Heslov were developing a story about a black family moving into an all-white suburb in the 1950s when Clooney remembered an unproduced script by Joel and Ethan Coen about ordinary idiots pursuing a criminal endeavor and getting in over their heads (a common Coen theme). For reasons that only Clooney can explain, he chose to cram the disparate stories into one screenplay. The resulting film, Suburbicon, is unsurprisingly disjointed, yet surprisingly not bad as a Hitchcockian, Fargo-lite quasi-satire. I credit that to the strength of the Coens' script, which occupies roughly 75 percent of the story and is too distinctive to be wrecked by a non-Coen's mishandling. Clooney, who directed five movies before this one and has starred in four of the Coens' own films, no doubt thought himself up to the task of interpreting their peculiar speech patterns and evocative one-scene characters for the big screen. He wasn't — he gets the tone all wrong — but darned if it isn't watchable anyway. The racism angle (a mistake) comes across as a fascinating error rather than a ruinous one. It's the late '50s in the squeaky-clean planned community called Suburbicon, and the Mayers family are the first African Americans in the neighborhood. The white people in the neighborhood freak out, saying blatantly racist things about property values and miscegenation. Neighbors on both sides of the Mayerses put up fences to block their view, but their back-fence neighbors, the Lodges, withhold judgment. Aunt Maggie (Julianne Moore) encourages young Nicky Lodge (Noah Jupe) to play with the Mayers kid, possibly just so she can see what happens. Nicky's mom, Maggie's twin sister Rose (also Moore), has been confined to a wheelchair since a car accident and has little interest in anything. His father, Gardner (Matt Damon), is also mum on the race issue, for now. Violence does come to Suburbicon, but not because of the black family. There is a home invasion perpetrated by two sinister, Coen-esque goons, and Rose ends up dead. Gardner, Nicky and Aunt Maggie are devastated, Gardner returning to his nondescript office job to a chorus of "So sorry to hear about your loss," but finding himself unable to work. Uncle Mitch (Gary Basaraba), the twins' brother, takes a fatherly interest in Nicky, realizing before we do that Gardner isn't much of a dad. Then things really go awry. Without spoiling anything beyond what is implied by this being (mostly) from the writers of Blood Simple, The Man Who Wasn't There and Burn After Reading, certain people's motives and actions are called into question, first by a cop (Jack Conley) who should be selling insurance and then by an insurance investigator (Oscar Isaac) who should be a cop. Nicky emerges as the true protagonist of the story, albeit one who observes and witnesses more than he takes action. While all of this is happening, the racists continue to gather outside the Mayers house to make noise and be a nuisance. Clooney's point in juxtaposing these separate stories never becomes clear beyond the obvious, facile one about using minorities and immigrants as scapegoats. The real story, a meat-and-potatoes crime caper with comic undertones, doesn't need the racism tangent and isn't improved by it. Clooney's handling of the main thread isn't smooth, either. He chooses an arch, plastic tone rather than a gritty or natural one, with a musical score by Alexandre Desplat that's intentionally oversized and melodramatic. It all has the sheen of satire without actually being satiric, save for a few moments. Keeping us at arm's length from the characters' emotions makes the dark story easier to swallow, but paradoxically, it also lessens the impact of the story's darkness. Suburbicon is not showing in any theaters in the area.